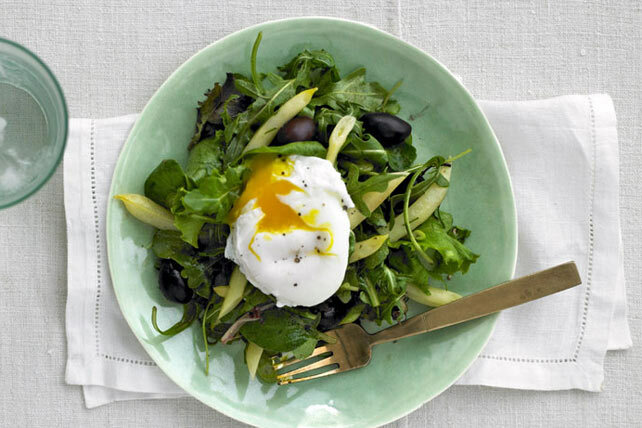 Topped with a poached egg, this Herbed French Salad looks like it could be tricky to make, but really—it's not! Check out the video and see for yourself. Eggland's Best® is a registered trademark owned by Eggland's Best, LLC. Combine all ingredients except dressing and eggs in large bowl. Place on 4 plates; top each with 1 egg. Bring 2 to 3 inches of water mixed with 1 tsp. vinegar to boil in large skillet or saucepan. Reduce heat to medium-low to keep water gently simmering. Break eggs, 1 at a time, into custard cup. Holding cup close to water's surface, gently slip eggs into water. Cook 5 min. or until whites are completely set and yolks begin to thicken but do not become firm. Use slotted spoon to lift out eggs. Drain in spoon or on paper towels. Trim off rough edges, if desired. Avoid precooking or reheating poached eggs. Substitute sliced or chopped hard-cooked eggs for the poached eggs.